January ends with a bang finishing up semester long ecosystem work. We ended with an exploration of population and the factors that influence its growth and decline. We discussed how resources can limit a population’s growth and keep things in check. We also discussed how, in the case of the human population, that we have overcome many of our limiting factors and have doubled our population three times in nearly 40 years. I’m excited to take students away from the macro-study of life and begin focusing on the micro-study instead. We are about to begin learning about cell structure and function, and spend the rest of the year looking at how cells impact everything from growth and development, to food production, to diseases, and adaptations to our environment. Exciting times ahead. 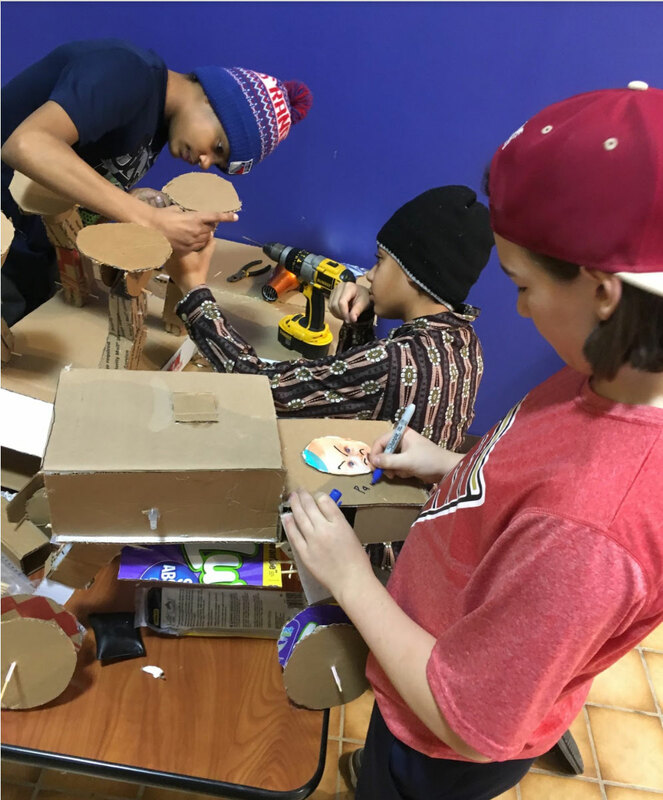 Students worked feverishly on their hydraulics projects in January. They used cardboard and medical syringes (just the plastic plunger/cylinder portion - no needles) to create a machine that moves via hydraulic force. Design challenges popped up and we dealt with them one by one. Rather than hurry through the project, we took on several unforeseen engineering problems and learned more than expected. For example, several of the students’ apparatuses converted the linear motion of the syringe piston into rotational motion. We found an extra pivot joint or “knuckle” was needed to allow for freedom of movement. Once one student discovered this innovation, several others followed suit. We will display these projects mid-February and hope to make them interactive for younger students. Toward the end of January, we switched gears to sound waves. We studied characteristics of waves and experimented with how sound waves travel. Do they travel faster through solids, liquids, or gases? 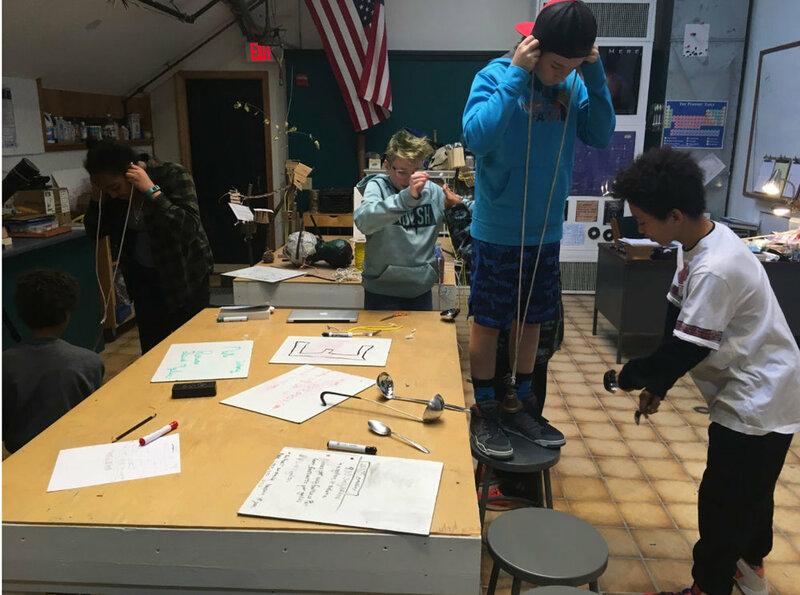 Stethoscopes, dimensional lumber, iron pipes, spoons, and rope all came into play as we explored the dynamics of sound waves. Students appear to really enjoy this class and accept note-taking and academic study as necessary complement to hands-on exploration. January was a busy and fun month for Earth Science. We relapsed a bit back to Rocks and Minerals and performed some additional investigations on Malachite, a beautiful, pseudomorphic green mineral with geometric structures called acicular prisms. We then delved into Earth’s atmosphere and calculated where the five atmospheric layers start and end to scale. Relating the exosphere, 400 miles thick, which extends 800 miles from the surface of the Earth to our planet’s diameter (8,000 miles) while creating an accurate geometric model, has been thrilling and challenging. Every day we ask questions and seek answers; we hypothesize and test, and most of all, we expand our understanding of the world we live in.